HP has introduced two HP Designjet latex printers capable of handling a broader range of indoor and outdoor signage applications with better durability than eco-solvent inks. Furthering HP’s strategy to disrupt the eco-solvent market, the 104-inch-wideHP Designjet L28500 Printer delivers speeds up to 70 percent faster than the HP Designjet L25500 Printer, while the 61-inch HP Designjet L26500 Printer is ideal for customers entering the growing soft-signage market. Both systems feature new HP 792 Latex Designjet Inks, which produce rich blacks and glossy results on banners and self-adhesive vinyl, and offer double-sided printing capabilities with less user intervention and more accurate, automated registration. Compatible with more than 500 media solutions, including the new HP Double-sided HDPE Reinforced Banner material, HP Latex Inks provide a consistent, reliable performance across a variety of substrates. HP also launched HP Latex University, a set of training materials and application workshops led by industry experts, as well as the HP Ecosolutions Trained Printing Company program for educating HP Latex Printing Technologies users in sustainability best practices. Ideal for high-impact point-of-purchase displays, soft signage, bus shelters, vehicle graphics and more, the HP Designjet L28500 and L26500 Printer series can print on a broad range of materials, including eco-solvent compatible media and low-cost uncoated options. 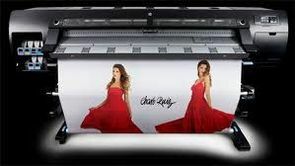 The new HP Latex devices produce 1,200-dpi output with outdoor display permanence of up to three years unlaminated or five years laminated for high-quality, long-lasting prints. The output also dries inside the printer, boosting productivity for double-sided print jobs, and allowing immediate finishing or use. Building on the introduction of HP HDPE Reinforced Banner, the new printers also are optimized to work with new HP Double-sided HDPE Reinforced Banner, a compelling alternative to PVC scrim for advertising applications. The substrate offers the image quality, durability and tear strength of standard vinyl without the environmental disadvantages of a PVC-based substrate. Availability of the HP Designjet L26500 latex Printer will vary by region beginning Nov. 3. The HP Designjet L28500 latex Printer is expected to be available Jan. 20, 2012. Helping to address the demands of environmentally conscious print service providers (PSPs) and their clients, HP Latex Inks produce odorless prints. These water-based inks are nonflammable and noncombustible, and, unlike many eco-solvent inks, they do not require hazard warning labels and contain no hazardous air pollutants. Additionally, no special ventilation equipment or external dryer is required for safe and productive operation, helping to keep energy costs down. HP 792 Designjet ink cartridges are now Eco Mark certified by the Japan Environment Association , demonstrating relatively few environmental impacts through the product life cycle from production to disposal. PSPs can return their HP 792 Latex Designjet supplies through HP’s free, convenient recycling program, including ink cartridges, printheads, the printhead cleaning cartridge and the printhead cleaning container. A recycling program also is available for a range of HP High Density Polyethylene (HDPE) and Polyester (PET) printing materials, including the new HP Double-sided HDPE Reinforced Banner. Additionally, the new printing systems reduce the amount of ink used during maintenance routines compared to eco-solvent technology. Now available through HP Capture, HP Latex University provides PSPs with training to successfully produce a wide range of outdoor and indoor wide-format graphics applications using HP Latex Printing Technologies. By signing into HP Latex University, PSPs can access free application workshops led by specialists, online webinars and other tools that help maximize the use of their technology. The first webinar series kicks off in November and focuses on producing vehicle graphics and textiles. Also available through HP Capture, all HP Latex Printing Technologies users can now participate in the free HP Ecosolutions Trained Printing Company program. This downloadable training is available in 10 languages to coach PSPs to take advantage of the environmental profile of their HP Latex printers, build an ongoing commitment to sustainability within their businesses and engage clients on their sustainability goals. PSPs that complete the training will receive a framed certificate and an icon identifying them as an HP Ecosolutions Trained Printing Company that they may use for promotional purposes.